Another debt paid and what a milestone. I hope my children will be proud. 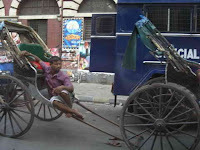 For years, I’ve known in my heart I had to visit Calcutta, India. I was full of trepidation thinking the cit y of 14 million would be so deformed by poverty and dirt that I wouldn’t be able to look out the window. 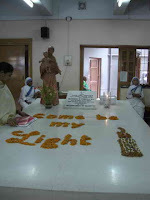 This is the place of Mother Theresa, in the process of sainthood since her death near the same date as the death of Princess Diana. 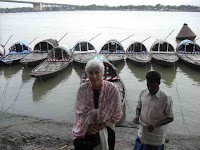 It was that tiny bent Albanian woman who had the courage and heart to walk among the most destitute of Calcutta, Hindus mostly, and bring them hope. She founded the Missionaries of Charity group of women - known for their white saris with blue trim and wearing sandals in the coldest of conditions. They now cover the world. These amazing sisters continue Mother Theresa’s work in this city beside a bustling Hindu temple and market dedicated to the goddess - one of thousands in the Hindu faith - Kali. Why this obligation to get here? 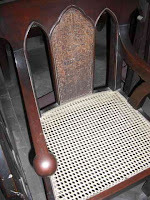 Years ago when I was newly ordained, I had communicated with Mother Theresa in hopes of making a donation to her work. She wrote me a small note - which I put in one of my Bibles and haven’t been able to find again since Uruguay. But then occurred her untimely death and I didn’t know what to do. I felt unworthy of the title given me in Montevideo as the Mother Theresa of Uruguay. Not true. So for more than twelve years I’ve carried in my heart this pledge to her, sometimes waking in the night because I knew I had to follow through. Ironically, God has been the tour guide on this long trip to Asia. With the closing of the Tibet border by China, two weeks of my trip were suspended. I told Jim I would like to know India, and especially Calcutta. So this was arranged. Yesterday, I fulfilled my promise to Mother Theresa. 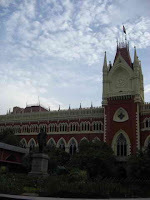 When I arri ved in Calcutta I was surprised at its landscape. Oh it’s huge, but there are enormous open parks, trees on every street rich or poor, and not so unclean and piercing to observe as you drive through streets filled with more yellow Ambassador taxis than taxis in New York City. This ex-capital of the British India is a city of wide streets, well preserved colorful buildings of colonialist style held over from the old days which my guide eagerly pointed out until I told him I’m not into British architecture. I’m interested in the people. 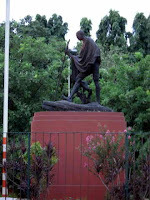 There are black bronze statues of fre edom fighters, heros and leaders of India many of who were assassinated: Ghandi, Indira Ghandi, his daughter assassinated by her own body guards in her own residence, Suryja Sea who was hanged by the British, and the less tragic Nehru. They stand on tall marble podiums and make amazing silhouettes. There is Asia’s largest cricket stadium (holds 95,000 people, which was to be filled today for an important match with Jaipur’s reigning team) and restaurants with names as Oh, Calcutta. There is the Royal Turf Club - a giant race track where horse races take place in the winter - and remainders of polo fields, since this is where polo began in India . Colorful buses with Victorian trim and awful rickshaws pack the city which is known as the Silicon Valley of India because of the major computer and technical companies centered here in Bengali territory. Bose sound systems were created by a Bengali who now lives in the US. Finally here are Anglican churches, the cathedral of which I visited and had the privilege of meeting charming Archbishop Raju at his headquarters where he was properly dressed in shorts and a cotton s triped shirt. 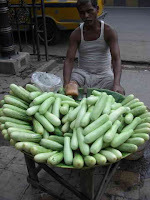 One adjusts one’s life to the heat in India. Believe you me. But people sleep on the streets, children snuggled up to their mothers on tiny blankets in the middle of the market places where odd thin men with painted faces and Shiek turbans look for a handout. Men live in a piece of cloth draped around their waist but no shoes, no shirt , no hat. 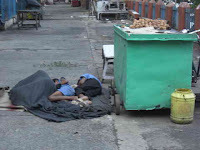 There are street dogs, street cattle, and street people who’ve made for themselves sleeping quarters out of blue tents, sticks, rocks, and cardboard. 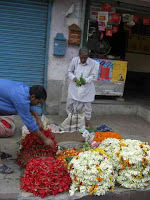 In the early morning, these homeless people open their little booths to sell the many flowers (strings of mini hibiscus, tuber roses, marigolds, and other common flowers)to Hindu temple worshipers. 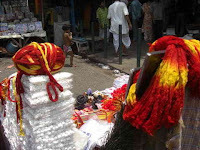 My guide told me that Hindus don’t regularly go to the 600 temples in Calcutta to make offerings like those in Northern India, although they tie red and yellow strings to the holy trees to ask for a wi sh to be fulfilled. If it is, they sacrifice a lamb. 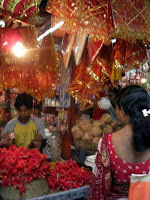 Hindus have so many many gods and goddesses to appease, but they believe flowers are the best medium to reach God quickly. If have flower in one hand you will be blessed by God. Hmmm. The Garden Clubs might like to know that. 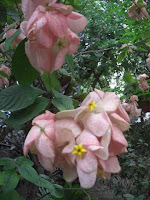 After arriving at the old British style Oberoi Grand Hotel, where Gerbera da isies float in every size bowl of water and the fragrance is overwhelming of jasmine, my guide swished me away to the Hospital of the Destitute and Dying, which is one of the labors of Mother Theresa’s heirs. When I walked through the door from the teeming street of well over 100 degree heat, I entered a cool oasis - fans going and windows allowing in some breeze. Two sisters were busily going about their work (they never have moist sweaty faces like the rest of us) and hardly noticed a new visitor. There were many American students volunteering that after noon. Everything was open space - the men’s wing which houses 55, the women’s wing, also has 55 beds, and the foyer where a electric bicycle stood unused for the moment. (Men volunteers carry the dying gentlemen and hold one on the machine and actually push his legs to make sure he pushes the wheel a certain number of times.) In the middle is a huge wash room, which means concrete floors with drain (nothing ceramic or fancy, just all practical) and large plastic bowls where a group of Korean youth were washing the metal lunch plates and cups. 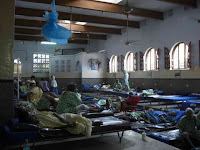 This is also where the shifts and shirts of the patients are scrubbed with hard brushes and cleaned, then hung up to dry outside on the second floor next to the chapel. Immediately, as I walked through the room of the women, their heads shaved, their bodies thinner than bone itself, a few reached out to me and acknowledged Namaste greetings with a faint smile and a touch of my head. My heart sunk to the floor. I knew I had to be here and God had made it emphatic. It’s been a long time since I was able to touch people at death’s door. It was a blessing in Uruguay. Now here I could smile, and embrace, and encourage even though the women didn’t speak English, only Hindu or their Indian dialects. Mother Theresa knew once a servant had been in this place, he or she found a new kind of spiritual urgency in life. 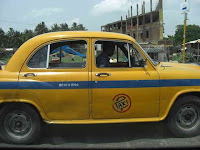 So I asked permission to spend my one full day in Calcutta as a volunteer. I was sent to the administrative offices on another street to meet Sister Lysa from India and Sister Prema of Germany. By now I am sopping wet from the heat in my black t-shirt and skirt, but ironically, I don’t miss air con dition, since now and then I grab a cool piece of air. I guess I could survive. 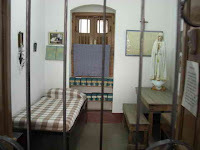 At the administration home, the life of Mother Theresa is preserved. Her few possessions are in protective display cases. There is a small museum, much like that at Ghandi’s last stand, where the life and sayings of Mother Theresa have been blown up on cardboard placards with photos of her. But more important, there is her tomb, a simple marble rectangle with marigolds scattered on top with the words: "Come Be My Light." She is always with her sisters of charity. She is always the inspiration where she needs to be that inspiration. Many come there to pray, removing their shoes because it is holy ground. The sisters at the administrative side were extremely friendly. I was able to give them the donation debt and clean out my soul. They gave me one of the Mother of Miracles medallions which Mother Theresa often handed out. They told me I must go a few blocks down th e shady street to the orphanage to get permission from Sister Karina to volunteer the next day. So I did. And I took home with me one of Mother Theresa’s prayers: O Most Kind Father of Us all, let me save at least one soul, One you already know. 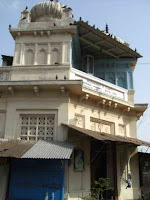 At 7:30 I was at the door of Mother Theresa’s domed hospital. The sisters were still at breakfast. A girl from Alabama who had been volunteering three weeks knew the ropes. There was not really any order. No one really tells you what to do. You just keep asking. We went to the upstairs chapel for a while and prayed. 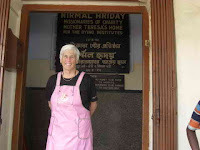 Then, proudly, I was able to put on the pink apron with the Mother Theresa Hospital logo. The work began with energy, as more and more volunteers arrived, mostly Americans from the Mid-West. First it was feeding the men and women on their beds. So me could not eat for the pain. Others were in semi-comas and had to be roused. Others were hungry and reaching out their hands. The hard part is not knowing their language to be able to comfort them with words, so I just tried to touch their hand or shoulder and say Namaste, to which they respond. After breakfast, it was into the steamy wash room to help dry the aluminum plates. And after that, armed with a small bottle of cream, I was told to give cream massages to the arms and legs of those who wanted it. Their dark skin was soft and not full of white dry lines, a result of their getting these massages daily. It’s a way of soothing them. The novices in green checked aprons did most of the medical work. It was easy to tell the volunteers who had long term commitments (like months) and they were resources for what should I do now. For a while, I felt I was more in the way than not. I kept a smile on my face and remembered what I had read from Mother Theresa: "Within me everything is icy cold. It is only that blind faith that carries me through. The smile is a big cloak which covers a multitudes of pains." Then one young woman with shaved head , voiceless and weak in a yellow gown, kept beckoning to me, pointing to her hip. She seemed to be suffering the ravages of AIDS. I don’t know. No one knows. But I sat down on her low bed and she pushed my hand to massage her hip (she was laying on her side.) So I slowly began to massage the area, she moved my hand to the right spot, and I kept this up for about a half an hour. It was this moment when she was able to sleep. My arms got stiff from the position, but my heart was flexible with "carinos." The volunteers receive a tea break on the second floor opened area. I filled up on cold water. We talked about our missions. I was the oldest. And then it was time to fold the many many cotton shifts that dress the women each day. A boy from Spain who had been here a few weeks, showed me the routine. There seem to be so many shifts to fold. He explained sometimes three or four a day might be used for one woman she has diarrhea. (These are the same ones scrubbed and st amped with feet in the wash room earlier.) Then it was back to serving lunch and drying more plates until life calmed down and it was time to wash the floors with disinfectant. This is when the volunteer shifts change. I was worn out but asadly took off my pink apron and walked through the spaces one more time. Thank you God for bringing me here. I have known the darkness to the worst degree on this long trip and now I’ve leaped into the light. So I leave you with these words from her daily dialogue with Jesus: "To leave that which I love and expose myself to new labors and sufferings which will be great.....but the voice kept saying, ‘Wilt Thou Refuse?" Photos: Mother Theresa's tomb; Ambassador taxi; Ghandi statue; Colonialists architecture; these are pews in the Anglican Cathedral; sleeping on the streets; flower seller; cuke man; Mother Theresa's room; a rickshaw man; Trip on the Ganges River; Red and yellow string to make a Hindu wish; offerings offered; In the pink apron of a volunteer; the women's wing at the Hospital of the Destitute and Dying where I volunteered; a pink shrub at the Archbishop's house.